On deck, foredeck view. 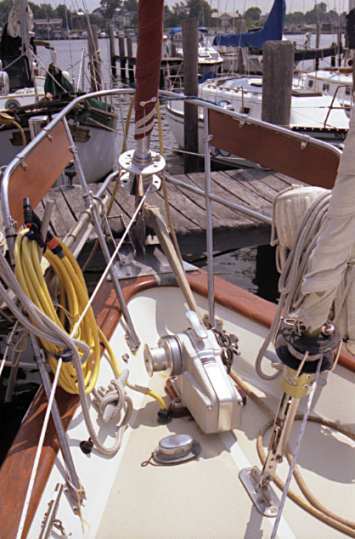 You can see the Lofrans Tigres windlass for the main anchor rode. It is mounted on a teak base to adapt it to the slightly curved foredeck. The chain locker is not very large, so there's not enough room for two big anchor rodes. I keep the rope and chain for the secondary rode in the cockpit locker, although there is a chain hole just to the left of the windlass if the rodes were smaller. On the bulwark just below the washdown hose you can see a small black object which is the connector for the handheld windlass controller. The controller has a clip so it can hang from the pulpit. On the bulwark at the bottom left of the picture is the handle for manual operation of the windlass. Just ahead of the windlass on the foredeck, but out of view, is the deck plate for the diesel fuel fill.